In the preceding post, I said, “that which is not earth is heaven.” It is a take-off from a quote in a play by Christopher Marlowe called The Tragical History of Doctor Faustus, published in 1604. 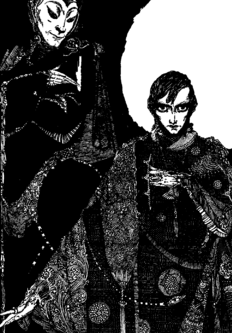 In this tragedy, Faust is bored and depressed with life, and he conjures up one of the Devil’s representatives. Mephistopheles appears to him and strikes a bargain. He will grant him knowledge and magical powers to indulge in pleasure for a number of years and in return, Faust will give up his soul to the Devil. There is some truth and untruth in the story. Since Brahma, the Divine Absolute, separated in the two parts of heaven and earth, there is no hell other than what appears on earth. Such is the case, but do not be fooled into thinking that Faust or anyone for that matter, will experience the joys of heaven by default. To enter the gates of heaven the knowledge and the practices of the Veda must be mastered. There is no free pass, and for those who come up short, the next life after this will be here. That is why it is called the Hereafter. Here is a Verse from the Veda for dispelling the darkness of the world. The Divine Influence of the sun is before sunrise, for stimulation, and the many powerful rays disperse the darkness of the world.